Are you reading through all the franchise hype, their successes, their awards, and their achievements? The common con is inferring their success will be your success. NOT TRUE! The truth for many of those listings is the deeper they can reach into your pockets and the deeper you are indebted with franchise startup fees, facility leases, equipment contracts, and personnel overhead, the more you are financially strapped and burdened by pressures of pulling up your bootstraps and getting to work — that is your working for them instead of being in business for yourself! Avoid stepping into their trap. Instead, consider Granicrete’s approach for focusing on your success through our Wholesale Distributor Business Opportunity. We are not a franchise! We are a proven turnkey wholesale distribution model where you keep all your profits while operating in your own exclusive market. You keep all your profits! We are not a franchise that collects royalties from your sales or obligating you to financial deficits for not meeting annual contract minimums. We equip you for success! We are an old-fashioned wholesale model that also equips you with multiple revenue streams. You get our double turnkey for success! Not only do we have the turn-key approach for your success, we also have a turn-key approach for the success of your customers. The success of your customers is fundamental to your success. Do these criteria meet your specific wants? Two-Year ROI of 67% based solely on your Owner Discretionary Income after expenses. Three-Year ROI of 114% based on the same. Breakeven Point of 14-16 months based on the same. Monthly inventory turns within a year..
Conservative forecast for Owner Discretionary Income growing to more than $165,000+ during year three with ongoing growth. Your ongoing growth will NOT require greater investments or capitalization of any kind. You can build a business quickly and profitably to keep within your family. Or, you can sell it to another party because of the true tangible value of a customer base that will reap huge financial rewards from the prospective buyer. We will show you how easy it is to hit these numbers. NOT A FAD! The decorative coatings industry is more than 30 years old. INDUSTRY IS NOT READILY KNOWN! Much opportunity for growth is ahead. EASY WHOLESALE BUSINESS MODEL! No retail hours, little overhead or employees required. Wear only a couple hats to achieve your success and our comprehensive training for you and for your customers means you do not need any prior experience in the coatings industry! SOLID WHOLESALE MARGINS! These margins are calculated after your inbound freight costs and we never intrude upon them. EASY TO USE PRODUCTS! That can be used for nearly every square foot in residential, commercial, and municipality markets. EASY LOW COST – LOW RISK FOR YOUR CUSTOMERS TO START! Granicrete products are applied using just a few hand tools and optional small equipment. Granicrete products are sought out by many parallel trade contractors and service providers. STRONG REPEAT CUSTOMERS! Installing our products yields huge profits for your customers and we have a turnkey sales and marketing system to support this too! BROAD AND DIVERSE CUSTOMER BASE! 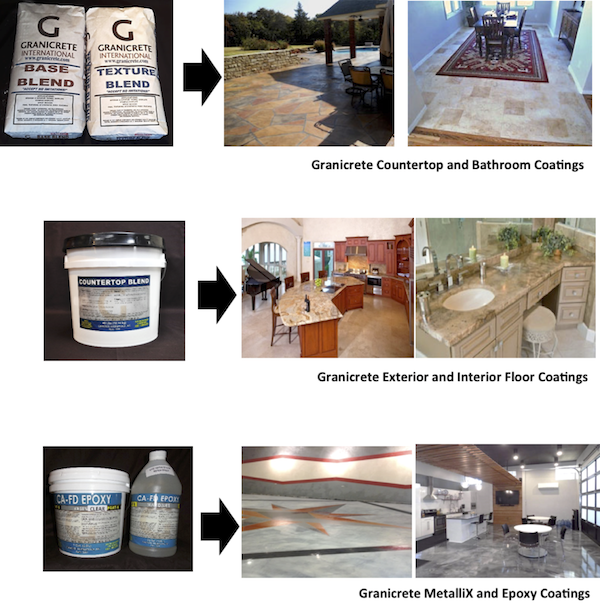 For more than a decade Granicrete products have been attracting coatings pros, contractors of parallel trades, and new entrepreneurs … and their clients. We will show you your revenue streams. We will show you your margins. We will show you the margins for your customers. You will discover how to grow simply. Our products are stronger than concrete and several times stronger than stone. They have excellent adhesion to many surfaces. Our overlay floor surfacing system coats damaged, worn and ugly pool decks, patios, driveways, interior concrete and wood floors, garage and warehouse floors. Our countertop surfacing system can be applied directly over Formica®, Corian®, laminates, cultured marble, MDF and even granite slabs. Both our floor and countertop systems are great for creating interior and exterior custom stone and wood wall finishes too. Our epoxy floor coatings are designed for residential and commercial applications offering simple industrial finishes to high-end showroom designs. All Granicrete’s systems have been created to be simply applied using basic hand tools of a trowel and a brush, then our engineered colorants are simply applied using spray bottles, and the new surfaces sealed with our nano-technology coatings by a roller brush. Such broad applications increase your opportunities for growing your business to a broad range of customers serving the residential, commercial and government markets. We launched the entire countertop surfacing industry in 2006 and received the Most Innovative Product Award at the industry’s World of Concrete show in 2007. Granicrete meets USDA compliance requirements and we are the only coating system to achieve the internationally recognized National Sanitation Foundation Certification for residential and restaurant use. The many Granicrete television appearances have all been by independent business owners who use Granicrete products that received our training. Such appearances are the testimony to the quality and success of our training system and engineered products. We have over 1,200 pictures in our web gallery with over 50,000 countertops surfacing projects and millions of square feet of flooring performed since 2006. These pictures of their projects affirm the pride and quality of work that your wholesale customers will also be achieving.